Having a study space adapted to meet your needs is crucial if you are to successfully study in that environment. 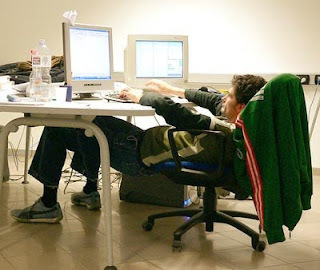 At the same time, ergonomic principles need to be considered so that you don't get into bad habits (e.g. poor posture) that cause damage further along the track. 1. Firstly, an introduction and an overview of ergonomic appropriate setups. Ergonomics is a science that addresses human performance and well-being in relation to various types of jobs, equipment, tools, and environment. I assume most of us don't consider the ergonomics of our study space (I know I didn't until the workplace health & safety people came round). In addition our adherence to ideal ergonomics, is obviously limited by what we have available to us (space, money, & so on). In saying that using our own ingenuity we can create study spaces which adhere to the fundamental basics. Primary: Usual Work Activities. Distance from elbow to hand. Secondary: Frequently required items, but not necessary. Reference: Outside arm's reach. For example textbooks. For the average person an arm's length away. Eyes should be at the top of the monitor & the monitor should be tilted slightly. Chair should be raised so that your forearm is parallel with the desk (or the angle between your fore-arm and arm if 90 degrees). Upon this depending on your height and the desk's, a foot rest may be required to support your feet. The angle at your knee joints should be greater than 90 degrees. Your chair is probably the most important piece of furniture and I would recommend investing in a quality one, if you wish to eliminate lower back and so on that may occur at a later date. The location and type of equipment (keyboards, etc) is also important for an optimum study space. So while this is a extremely brief overview I thought it was an important issue to raise. Typically, since most of us are relatively young we have yet to feel the consequence of bad posture and so on. Furthermore, changes such as the above can also lead to increases in productivity. Of course, only you can judge what is best for you, so I encourage you to adapt the above tips to your own needs. Below is a list of related articles that go into further depth. And to give you a glimpse into what I maybe discussing next week check out some of these funky workspaces selected by Lifehacker.